When you draw, resize, or move a shape or other object, you can have Word align or snap the shape or object to the nearest intersection in a grid or to other shapes or objects. Note: To use snap-to, you must view the document in Print Layout. To activate Print Layout, click View > Print Layout. 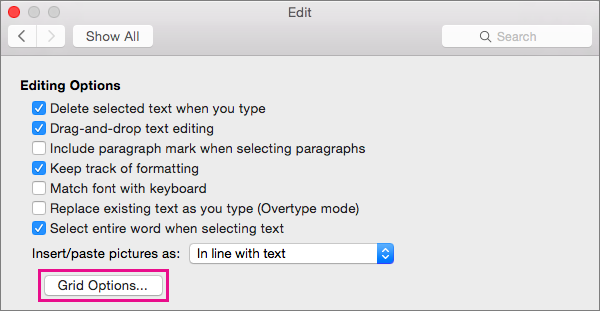 In Word Preferences, under Authoring and Proofing Tools, click Edit. In Edit, click Grid Options. To snap objects to a grid, select To grid in Print Layout View. To snap objects to other objects, select To other objects under Snap Objects. Change the spacing and set other options for the grid, if you want to do so, and then click OK.
To stop objects from snapping to the grid and to other objects, clear both options under Snap Objects. 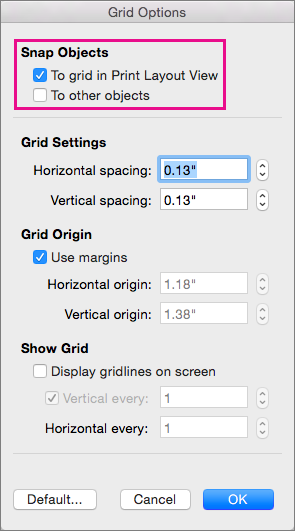 If you were using visible lines for the grid, you might also want to clear Display gridlines on screen under Show Grid.